Do you know the saying “less is more”? I wish that was my philosophy. Mine however, is “more is more”. Thus when I come across anything with crystals, it screams my name! More crystals! Recently I bought these two pretty wall sconces at my favorite antique store up North. I knew they would look perfect in the master bedroom at the lake! The master bedroom at the lake is is quite small. It measures a cozy 11 by 13 feet. It perfectly houses a king size bed and two small dressers that double as night stands. There is a small bench at the foot of the bed where we put our suitcases and stash our shoes underneath. Over the bed is one of my favorite pictures. It’s called the Singing Butler. I bought it years ago when Bombay Company was still a box store. I love the romantic vibe of the print. Although I liked the look of the print and the plaque over top, it still needed a little something. 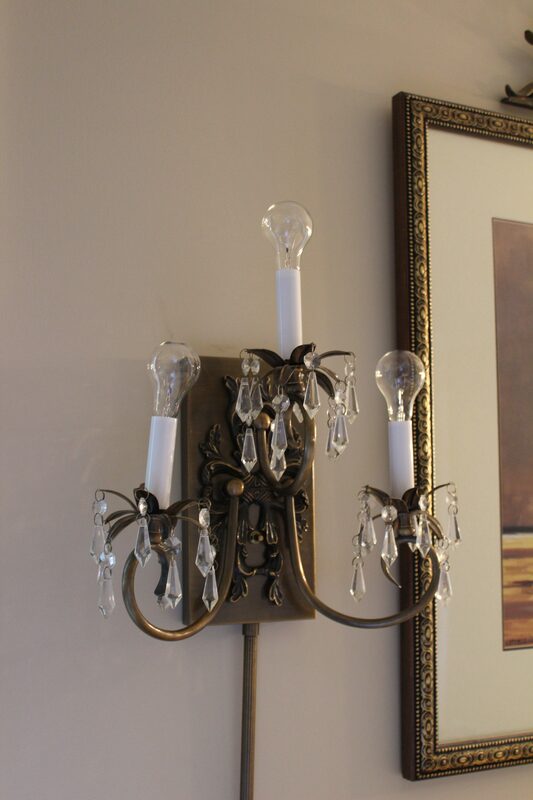 As soon as I found these sconces, I knew they would fit the bill! Thank you for stopping by! You can also follow me on Facebook and Instagram under Dellsdailydish!